These are all buzzwords that regularly crop up in the beauty industry, driving women (and men) all around the world to spend thousands of dollars on skincare products that they may or may not need. In fact, the global skincare industry is currently estimated to be worth around $130 billion by 2019 — that’s a lot of miracle cures. And we can only assume that the industry will snowball even further in this selfie-obsessed age. People want to look good — fact. But with so many products to choose from, it can often be a quagmire of irrelevant creams and dissatisfying serums out there. One new startup sees itself as the beauty industry’s knight in shining armor. Fed up with the BS spouted around skincare, Proven uses artificial intelligence to create individual skincare routines based on skin types and needs. And, with all the lofty promises in ads and on billboards, is it any wonder that people are left disappointed when miracles don’t happen? “No single person is capable of reading the amount of information there is in order to make a sound decision,” continues Zhao, going on to add that this was the reason behind building the largest database in the beauty industry. Using co-founder Amy Yuan’s computational physics background, the duo has put together an AI engine that sifts through reviews of skincare products. 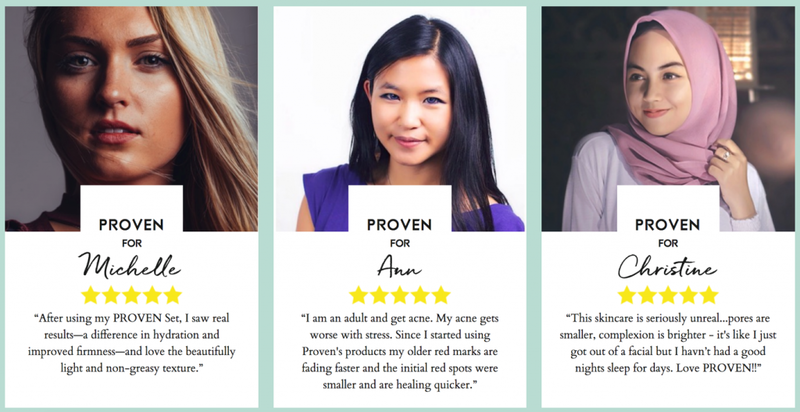 To date, the engine has analyzed around eight million skincare product reviews, 20,000 ingredients, and 100,000 products using a sophisticated algorithm to eliminate any fake reviews. When it sifts through this data, it can pick out general patterns and trends to determine what products are suitable for particular skin types. And so Proven was born. Now that the algorithm has large quantities of data in its clutches, the engine can be let loose on the public. It works by encouraging people to take a skincare routine quiz that culminates in a categorization of what skin type you have before offering a selection of Proven’s custom skincare products (which are mixed on-site by a chemist). 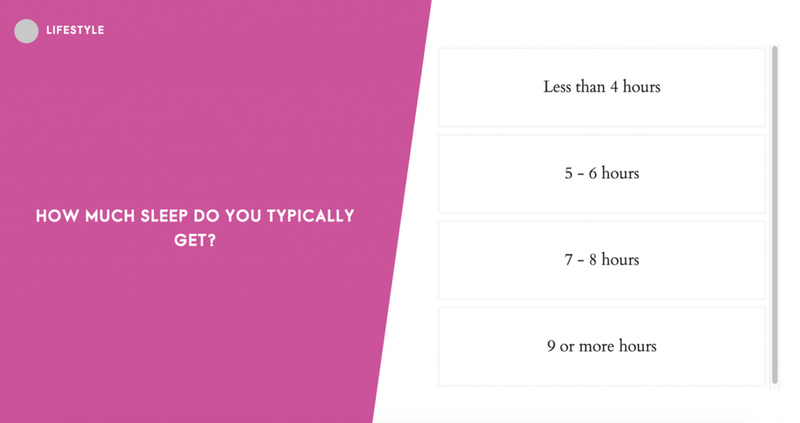 Quiz-takers can then opt-in to Proven’s bundle of personalized goodies that costs $120 every two months. Though the AI machine still needs input from each individual, like what products they can’t live without, whether they have an oily T-Zone, and skin allergies, it then uses the mammoth amounts of data is has sifted through to provide a customized solution. Zhao and Yuan’s main idea was to tap into the power of deep learning algorithms to pick out useful, relevant information from millions of testimonials online and turn the overwhelming amounts of data into a formula to predict skincare routines that actually work — no miracles involved here, just cold, hard data and facts. Why Use AI in Skincare? This is where AI swoops in and metaphorically saves the day (or saves the face of the whole industry — get it?). While focus groups can’t provide a recipe or a formula for success, AI can. Or, at least, it has the capabilities to. The traditional skincare model of business rests on focus groups, consumer research, and celebrity endorsements which, although are powerful in “speaking” to people who want to look good, don’t provide personalized information for each individual. And, let’s face it, everyone is unique. No two people have the same skin, so it’s impossible to promote a product that is a one-size-fits-all. 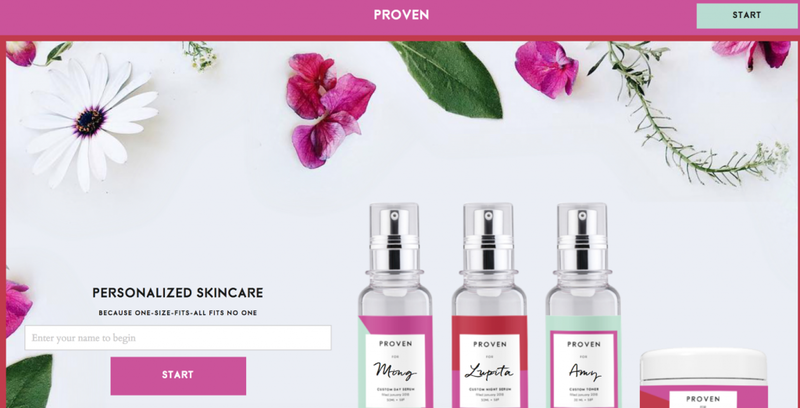 New startups like Proven are on a mission to disrupt these attitudes and outdated ways of researching and advertising in the skincare world. Instead of helping women buy into the “dream” of miracle cures and skin that looks ten years younger, the co-founders of Proven are on a mission to bring a rational, logic-based approach to the skincare industry; an approach that systematically and sensibly figures out what ingredients are most appropriate for each individual. But the main question that keeps cropping up around AI-generated beauty routines is whether the data scraped together can actually lead to useful machine-based decisions. Again, the skincare industry is incredibly subjective and, while reviews might be a good way to determine if a product is for you on an individual level, large amounts of it might generate conflicting viewpoints. So far, Proven has definitely had a good go at disrupting the current (and potentially archaic) narratives of the skincare world, where emphasis is placed on miracles and fancy buzzwords are used to exacerbate peoples’ need to look good. Using the latest technology seems like a good way to bring those archaic notions into the present day, but is something like AI a useful tool for something as personal and as individual as skin? As of yet, that remains unproven. Do you share our vision of making life easier for people WITHOUT compromising their privacy? ➞ Click the 👏 below to CLAP for this piece. ➞ SHARE our story with people you think will benefit from it. ➞ Get the latest updates — FOLLOW our blog, Reddit, Facebook, or Twitter. We’re working hard to bring you great content. If you have something you want us to write about, let us know in the comments below!